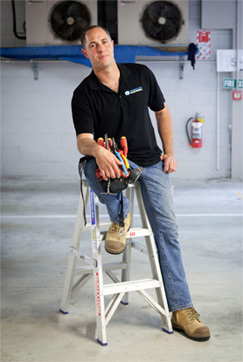 Frontline Electrical Auckland are about offering prompt efficient service and quality workmanship at competitive rates. We pride ourselves on delivering professional service using the latest technology and quality electrical products. We value our customers and understand that quality and reliability are essential to the success of our business. Our certified, registered electricians comply with OSH regulations, are members of Site Safe and have the experience to take on the biggest electrical projects and the attention to detail required to handle even the smallest jobs. Here at Frontline Electrical Auckland we have extensive knowledge and experience in electrical services for electrical repairs, electrical installation, electrical maintenance, electrical upgrades and commercial electrical installation projects. The Frontline team work with you to meet your needs. Whether you’re looking for an Auckland electrical contractor, support for a breakdown or an installation team for a project, our qualified, friendly and dedicated team of Auckland electricians can help! We offer quality installation, project management, repair and maintenance services for all plant, equipment and machinery. Contact us for all your electrical maintenance and we will work with you to find the best possible solutions to help you save time and money. We are experienced rural electrical contractors and specialise in pump installation, maintenance and repairs as well as all rural electrical work. We cover all electrical services for your home. No job is too big or too small. Our friendly team can help you get the job done with a high standard of quality service. Call Frontline Electrical for all your electrical needs and ask for a no obligation estimate or request a quote online. Servicing… The Greater Auckland Area including \ North Shore \ Northcote, Devonport \ Bayswater \ Glenfield \ Forrest Hill \ Birkdale \ Bayswater \ Beach Haven \ Wairau Valley \ Takapuna \ Birkenhead \ Chatswood.